EXCLUSIVE: MoJo interviews the two activists behind Occupy Wall Street’s poignant Tumblr sensation. It began as a simple little idea, just another blog among millions. 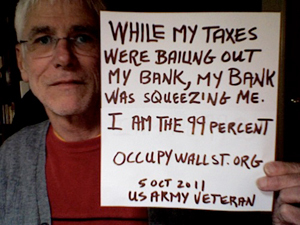 The Occupy Wall Street protest was scheduled to begin on September 17, and launching We Are the 99 Percent on Tumblr seemed like a good way to promote it. Its creator had no clue that it would go viral and become a touchstone for a protest movement soon to spread nationwide. Explore MoJo‘s updated map of protests nationwide. Check out all of our #OWS coverage. This week, Mother Jones tracked down and spoke with the two activists behind the 99 Percent sensation, whose identities have remained unknown until now. The blog is the creation of a tenacious 28-year-old New York activist named Chris. (He asked that his last name not be published because he works full time for a small media outlet.) Chris has also been busy managing logistics, including food drives, for Occupy Wall Street in Lower Manhattan—so about two weeks ago, he started sharing the blog’s increasingly demanding curation duties with a friend in the cause, Brooklyn-based nonprofit worker and independent media maven Priscilla Grim. On September 8, the first day he started publishing submissions, there were five posts. Less than a month later, the blog was posting nearly 100 pieces a day: from the 61-year-old who lost her job and moved in with her kids, to the husband of a college professor on WIC and Medicaid to support an infant daughter, to the fiftysomething couple living on tossed-out KFC, to a bevy of youths pummeled by student debt and too poor to visit a dentist. Mother Jones: What is your background, and your role in the Occupy movement? Chris: I am 28 years old, college educated, full-time job, part-time freelance job, and I volunteer to feed the hungry and needy every Sunday. I live in New York City. I wear a tie to work, unless it’s Friday. I am an anarchist, though my belief is that anarchism should be more about building things up than tearing things down. I am a dedicated pacifist. I drink too much coffee. My favorite band is Sleater Kinney, and I think their best album is Dig Me Out, followed closely by One Beat. I’ve read Infinite Jest twice, and I’m fully aware of how pretentious that makes me sound, and I’m really, really sorry. Priscilla Grim: I worked for nonprofits for 10 years, have studied online media in school, and I am currently in grad school studying information science. I helped to organize online actions pre-MoveOn. I love serving people and improving the world, firstly for my kid and secondly for the rest of us. I worked in a lot of different realms and know how to build organizations and make them sustainable, if I am working with like-minded, determined individuals. 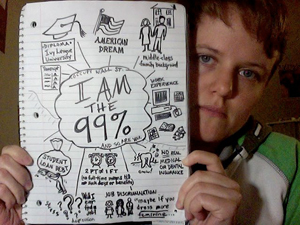 MJ: What is the origin of the 99 Percent idea, and how did you decide to present it on the Tumblr blog, using submissions? C: Well, from doing a little bit of research on occupywallst.org, the earliest mention I can find of “99 percent” is this flyer, which was made to inform people of the second General Assembly, which functioned as, essentially, our planning meetings during the buildup to all of this. As for the blog, I really wish I had a cool story to tell, maybe something involving ninjas and running down a tunnel with a fireball chasing after me, but the truth is that it was just one of those random thoughts you get throughout your day that make you go, “Huh, I should write this down,” before going on with whatever it is you’re doing. Except in this case I actually wrote it down. It didn’t require a lot of tweaking since the idea itself is quite simple: Get a bunch of people to submit their pictures with a hand-written sign explaining how these harsh financial times have been affecting them, have them identify themselves as the 99 percent, and then write “occupywallst.org” at the end. It was something simple that most anyone with a computer could do, so that even if they couldn’t make it to the occupation, they could at least help build its narrative. MJ: What was your motivation for the presentation, the idea of people posing with their stories, and with most obscuring their faces? And the person’s face would have been fully revealed. However, as it’s progressed, I’ve seen stories that can’t be told in just a sentence. It also occurred to me that people may not be comfortable showing their full faces. So, we’ve come to be a lot more flexible when it comes to things like that. And, in all honesty, I think the blog has benefited. With hindsight, it occurs to me that demanding conformity with this strict uniform format would have made all the stories start to sound the same, smoothing out the diversity and making it much more bland. So, thank goodness for rule-breaking! MJ: How does the Tumblr work, practically speaking? There seems to be a narrative rhythm to it. PG: We post almost all of the submissions. It’s really hard because so many of our fellow citizens have such remarkable stories, and they write more of a letter than a simple fact. For many of these entries it feels like this is the first time anyone has asked them to articulate exactly what about the system in which they live is not working. C: We try to post as many as we can, but when the inbox fills up literally while you are working through it, and you’re only doing this during the little free time you have, this can be quite difficult. I think I cleared the inbox once during the entire time I’ve been doing this, and then the next morning there were tons more. There’s not much to curating it. I go through and read the submissions that, from the outset, look ideal: simple format, full face, hand-written. After that, I comb through the ones that may not entirely fit the format (the really long ones, for example) but still look okay, and publish them. After that, I delete any that are illegible or too blurry to read. MJ: Have submissions been steady? Did you notice a real turning point in volume? C: We get more than 100 a day. I just logged on now to check, and I have 106 new messages. And it’s only 9:49 a.m.
PG: It did start as a handful…suffice to say that I have read many long letters about medical and student debt, abusive families inside which people are trapped, and the hard choices that people have to face every day, choices that I am sure they thought they were the only ones making—until this Tumblr. MJ: Why do you think it is connecting so strongly? PG: Because we all have a story, and the conversation about social safety nets has been lessened to that of accounting and not of the day-to-day realities. It is one thing for me to tell people that I have not been to a dentist in five years; it is another to confess that I deal with frequent wisdom tooth pain with ill-gotten muscle relaxers and ice pops, and this has been my reality for at least two years. C: I think they want to let others know that they’re out there, that they exist, that their problems exist. That they’re not just some statistic compiled in a spreadsheet, that they’re real human beings with real human challenges. That they won’t be an abstraction, a walking political cartoon for people to argue and debate over while nothing gets done in the end. They’re not just “indebted students,” “the uninsured,” “the foreclosed.” They’re THIS indebted student, they’re THIS uninsured person, they’re THIS person whose home was foreclosed. Specificity has great power. On the reader side, I think people look for connection, some escape from solipsism, to know that they’re not the only ones scared for the future, that they’re not the only ones who do everything they’re supposed to do and still fall down, that they’re not the only ones who are starting to wonder whether their individual suffering is indicative of a much deeper, much more fundamental sickness in our society. Struggling with money, you focus so much on your own survival that you can feel very isolated and alone. Knowing others have the same struggle, and that they too are scared, can do much to ameliorate this isolation. Though, this is all speculation. For all I know, there’s a lot more hand-written sign fetishists out there than I thought. MJ: Priscilla, do you have a link to your own 99 Percent submission? PG: I do, but this is not about me…this is about the 99 percent. MJ: Have you gotten many inquiries about the Tumblr, or any interesting messages of support or criticism? PG: The Huffington Post has dedicated serious resources to the blog, calling it a populist call to action, which is pretty amazing. I am amazed that the response has been so overwhelmingly positive. Seriously, out of all of the contact that we have gotten with the press and citizens I have received two negative comments. Try to find that reality anywhere on the internets. Finally, we have all found something that we agree on. MJ: How important, in your mind, has social media been to getting Occupy Wall Street to where it is? There’s probably gonna be a lot of hype, in hindsight, about the role of social media. PG: I don’t think this could have been possible without social media to link people to real information on wealth inequality, and to possible solutions that are on the table to help balance the power structure. Every time we go on the web, it is to learn something. Right now Occupy Wall Street is part of an essential education and conversation on wealth inequality so that people can bring their own demands and solutions to the table. It is an education that we all should have and a conversation that is vital to the future of this country. MJ: What are you currently doing beyond the Tumblr? Are you on the ramparts? PG: My neighbors rounded up a carload of supplies for the campers which I have brought. I have been sleeping in the park on and off, much to the amazement of my friends and family. I am on the edge of 40 and such behavior is seen as a little extreme, but we are fighting an extreme system, and if sleeping in a park will bring attention to it, then put down some cardboard and I will bring my sleeping bag. Other than that I am around, doing what I can, lending professional consult when asked. This is an occupation, and we are not leaving until there is systemic change. We have no choice, it is time to shift power away from the corporations and into the hands of the people whom they should be serving. C: I helped spearhead the food committee during the planning stages, which involved fundraising and securing material donations to get the initial supply of food, and helped get the main food station going when the occupation formally began. I say “I helped” instead of “I did” because none of what we have could be possible without the assistance of many dedicated and passionate people who also realized that the boring stuff is going to have to be taken care of if we expect this thing to have any legs. For the first few days, I was at the food station pretty much all day, every day, even sleeping beside it when I was camping out in the park, and got people to help me mostly on an ad hoc basis. Now I go to the camp right after work, changing in the bathroom, to find five or six experienced people already at the station and keeping things under control. At this point, I mainly play a support role, helping prep food, going on supply runs, organizing food donations, and keeping people informed of what the food station needs. Incidentally, the way the food station has evolved is pretty much nothing like how I initially imagined it would be. This is a good thing: It means that it can, theoretically, go on without me. We want to avoid concentrations of power as much as we can. If the entire thing collapses if one person happens to leave, we know we’ve failed. As it is right now, amazing things are happening there, and it’s all because of the ideas of people who’ve volunteered their time and efforts to making sure everyone is fed. MJ: Where do things go from here? C: Truthfully, I don’t know. I don’t think anyone really knows. What I’d like to see is something that gets people to question some of the fundamental assumptions that they make about the way the economic system works, and to take action when those assumptions no longer satisfy. Whether this takes the form of global non-violent revolution, or just something that gets people to challenge their worldview, the important thing is to go as far as we can for as long as we can, and to try as hard as we can. Because that means the next time someone else is going to try harder. And then, someone else will try harder than that. Until, eventually, we win. 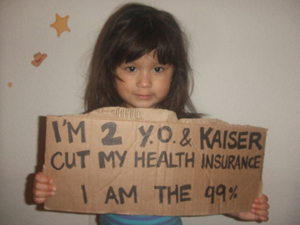 All photos courtesy of We Are the 99 Percent.